I periodically list people who have suffered horrible abuse because of despicable actions by government. At some point, I’ll have to create a special page to memorialize these victims. Something like the Bureaucrat Hall of Fame or Moocher Hall of Fame, though I haven’t figured out a good name (“Victims of Government Thuggery Hall of Fame” is too wordy). Anyhow, many of these unfortunate people (the Dehko family, Carole Hinders, Joseph Rivers, and Thomas Williams) have something in common. They are victims of theft. But they can’t call law enforcement because their money and property was stolen by the government. Such theft is enabled by “civil asset forfeiture” and we can now add Gerardo Serrano to the list of victims. The Washington Post has the disgusting story of what happened. On Sept. 21, 2015, Gerardo Serrano was driving from his home in Kentucky to Piedras Negras, Mexico, when his truck was searched by U.S. Customs and Border Protection agents at Texas’s Eagle Pass border crossing. After finding a small ammunition clip, the agents took Serrano’s truck from him. Two years later, Customs hasn’t charged Serrano with a crime, and they haven’t given his truck back either. The bureaucrats could take his truck because Civil asset forfeiture basically gives bureaucrats a license to steal. I’m not joking, though I wish I was. Customs seized the truck under the laws of civil asset forfeiture, which allow authorities to take cash and property from citizens upon suspicion of criminal wrongdoing. Because it happens under civil law, no criminal conviction — or even criminal charge — is necessary for authorities to take property they believe is connected to a crime. That’s bad enough. But it gets even worse when you read about what happened to Serrano. 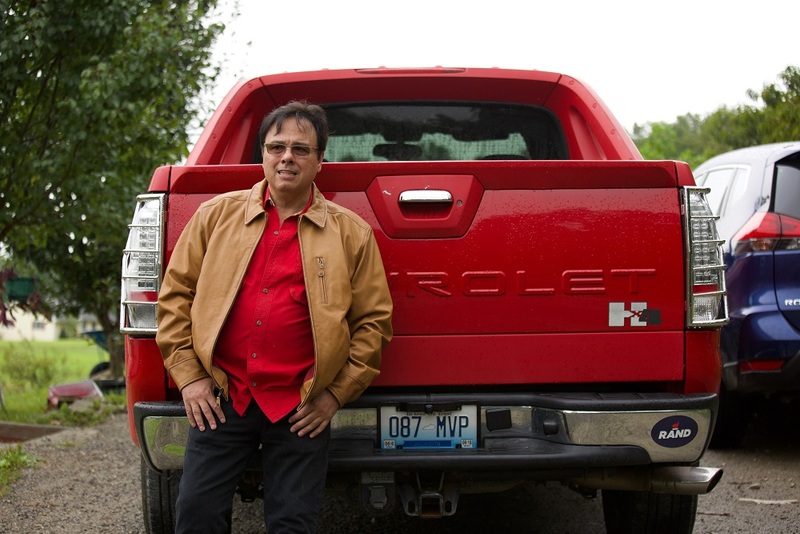 In September 2015, Serrano drove his new Ford F-250 pickup from his home in Kentucky to the Mexico border. He was going to visit a cousin he hadn’t seen in many years. He snapped a few photos with his phone as he drove through the checkpoint, planning to upload them to Facebook, just as he says he had been doing throughout his whole trip, to share the experience with friends and family back home. That’s when the trouble started. One of Serrano’s photos shows two Customs agents looking in his direction, hands held up. According to his lawsuit, the agents objected to his taking photos. Are these bureaucrats members of some primitive jungle tribe that believes a photograph steals their souls? That would at least be a semi-rational explanation. But if you read the rest of the story, they’re apparently petulant jerks (I had other words in mind, but this is a family-friendly site). Those agents waved him over to the side of the road, on the U.S. side of the border, and demanded he hand over his phone. Serrano said “no.” Customs declined to say whether there’s a prohibition on photography at border crossings. …one of the agents unlocked Serrano’s door, unbuckled his seat belt, and yanked him out of the car. “I know I didn’t do anything wrong,” Serrano told The Post. “So I say ‘listen, you can’t yank me out like that, I’m an American, you can’t do that to me.’”The agent took his phone, and demanded Serrano give him the passcode. Serrano recalls he told the agent to “go get a warrant.”By this time, other agents had started searching his truck. “I said, ‘Hey listen I have rights, you’re violating my rights, you’re not supposed to do that kind of stuff,’” Serrano recounted. …“I’m sick of hearing about your rights,” the agent said, according to Serrano’s lawsuit. “You have no rights here.”Eventually, one of the agents searching the truck found an ammunition clip containing five .380-caliber bullets and yelled “we got him!,” according to the lawsuit. …Serrano had planned to take his pistol on the trip, but he left it home at the strong urging of his cousin, who explained the potential consequences of bringing it to Mexico. But he didn’t realize the extra ammunition clip, containing five .380 caliber rounds, was still in the center console of his truck. The bureaucrats must have been trained in Venezuela. At the crossing, the CBP agents put Serrano in handcuffs and continued to ask him to give up the passcode. “You go get that warrant,” Serrano says he told them. “I’ll wait for you in jail.” Serrano didn’t believe that any judge would grant a warrant to search a phone for taking pictures at the border. …The agents eventually placed Serrano in a locked cell without food, water or a toilet, Serrano says. Periodically someone would come in and ask for the passcode to his phone, he says. He refused every time. The good news is that Mr. Serrano won, sort of. Serrano says that after three hours, the agents told him he was free to go, returned his phone and said he wasn’t being arrested or charged with any crime. Serrano says he was elated. The bad news is that the bureaucrats stole his truck. But then, the agents handed him a document informing him that Customs was taking his truck and the ammunition clip. Those items were “subject of legally becoming the property of the Federal Government (forfeiture),” according to the document, because Serrano had failed to disclose the presence of the clip, making the truck a “conveyance of illegal exportation.” …Several weeks later he received a formal forfeiture notice from Customs, informing him that the government believed his truck was being used to transport “arms or munitions of war.” The notice gave him a number of options to pursue if he wanted his truck back. Here’s the part that only be described as adding insult to injury. One of the options was to make an “offer in compromise” — send Customs a check, and if they deemed the amount to be high enough, they would return his truck to him. “That’s like a shakedown,” Serrano said. Fortunately, the great folks at the Institute for Justice are helping him challenge this horrific example of theft by government. By the way, you may be thinking Serrano is some sort of thug, maybe a gang member from MS-13? I’ve had some defenders of civil asset forfeiture claim that the program is justifiable because it gives law enforcement leeway to go after bad guys that they can identify with their “sixth sense.” Was Serrano a bad guy who was nailed, albeit using a bad law? Serrano sounds like a great American. If he’s an immigrant, I want more just like him. He understands what’s really doing on. For what it’s worth, I hope Senator Rand Paul (who is willing to fight for liberty) place a “hold” on all nominations to the Justice Department and Department of Homeland Security until and unless the government returns Serrano’s truck and compensates him for mistreatment. Let’s close with some additional excerpts from the column that explain the injustice of civil asset forfeiture. Many Americans haven’t heard of civil asset forfeiture, the legal provision that grants police the authority to seize cash and property from people not charged with a crime. The practice doesn’t follow the traditional American concept of “innocent until proven guilty.” If police suspect that you acquired something as a result of illegal activity, or even if it is connected to illegal activity, they can take it from you. If you want to get it back, the onus is on you to prove you got it legally. Once property is seized and forfeited, in most states and at the federal level police can either keep it for themselves or sell it at auction to raise money for the department. Critics say this creates a perverse profit motive. …said Robert Johnson, Serrano’s attorney. “That’s an open invitation to abuse.” The practice is widespread. In 2014, for instance, federal law enforcement officers alone took more than $5 billion worth of cash and property from people — more than the total amount of reported burglary losses that year. After public outcry, the Obama administration put in place a number of restrictions on forfeiture that made it harder, in some cases, for authorities to take property without a criminal conviction. But Attorney General Jeff Sessions recently reversed those restrictions. Every sentence of the above passage is spot on. Including the last two sentences. The Obama Administration actually took a small step in the right direction, but that was reversed in a terrible move by Trump’s Attorney General. And here are some excerpts from a column published by CapX. …asset forfeiture lets government agents seize Americans’ assets (cash, but also cars and even houses) on the mere suspicion that they were involved in a crime. Asset forfeiture is intended to deprive criminals of their ill-gotten gains, but frequently enables police to take the property of Americans who remain innocent in the eyes of the law. …Asset forfeiture primarily targets the poor. Most forfeitures are for small amounts: in 2012, the Institute for Justice, a libertarian law firm that has focused heavily on asset forfeiture, analyzed forfeiture in 10 states and found that the median value of assets seized ranged from $451 (Minnesota) to $2,048 (Utah). Given that law enforcement routinely takes everything they find in a forfeiture case, these small values suggest the relative poverty of the victims. The procedural hurdles for challenging asset forfeiture also mean that poor people are less able to get their money back. The average forfeiture challenge requires four weekdays in court; missing four days of work can be a prohibitive expense for Americans living paycheck to paycheck. …Asset forfeiture is especially dangerous for the unbanked, because police and federal agents consider high amounts of cash to be suspect. …Asset forfeiture functions as a regressive tax, which reduces low-income Americans’ economic mobility. A family that sees their savings wiped out has to start again from the bottom. A person whose cash rent payment is seized may turn to payday loans or the black market, or simply be evicted—none of which are conducive to upward mobility. Civil asset forfeiture is reprehensible. The fact that poor people are disproportionately harmed is awful (and pervasive in parts of the criminal justice system). P.S. To their credit, the first two administrators of the federal government’s civil asset forfeiture program now recognize that it’s become an abusive monster and want it repealed. P.P.S. It’s possible that the border bureaucrats were acting because of bias, of perhaps profiling Serrano because of his Latino heritage. But I never hurl that accusation without some real evidence. Unlike some people. The bottom line is Civil Asset Forfeiture is theft under color of law. I think the US experience is due to all three you mention: historical serendipity, rational thought, and culture. The serendipity was the blank slate that existed around 1780. The founders had a very, very rare opportunity to establish something new without having to worry as much about fighting entrenched interests. The rational thought was the Adam Smith / John Locke / Scottish Enlightenment theories of individual freedom and self-government. This guided the founders in populating the blank slate. The culture to support individual freedom, self-government, and respect for commerce existed before the blank slate and stayed strong for a long time. It has frayed, but I think is still stronger than in many countries. The US constitution and culture have slowed down the socialists enough that they have not won yet. It can still go either way. That’s why we need to keep fighting the good fight. That and other pockets of authoritarianism (like worldwide taxation) which are completely un American and mostly belong to regimes that don’t even exist any more lend credence to the theory that American freedom is a result of historical serendipity rather than rational thought, or even culture. Perhaps Americans simply have not had the time to descend into statism. The continuing American trend towards convergence into a more statist worldwide norm is certainly another data point. That is why, while I think America remains freer overall, and like my adopted country of residence (also for practical reasons), I still admire more those few countries in the old world which having had plenty of time to descend into coercive collectivism have nonetheless refrained from doing so; like Switzerland for example. As a corollary, in many ways, I find more hope for humanity’s future in Switzerland than in America. Of course I think Switzerland is in a very precarious situation surrounded by the European statist monoblock, but that’s another story. It is troubling how badly our criminal justice system has gone astray of servicing the public, as opposed to prosecution. It is hard to understand how, and why, the Department of Justice has refrained from investigating, and prosecuting its own employees, such as FBI Director Comey, for deficiencies in carrying out the duties of his office. Beyond being administratively deficient, this near cavalier attitude puts into question even the word of individual public servants who have sworn to carry out the laws of the land, and the constitution. Sadly, this lax attitude in public service extends to other departments, e.g., the IRS, and the Department of State. Thw deficiency is affecting the public’s trust, not just in the bureaucracy, but the entire system of government.